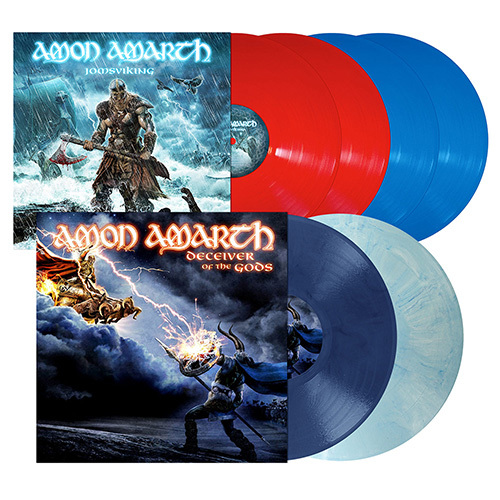 Amon Amarth has a long history with Metal Blade Records, that goes back to 1998 when they released their debut album, Once Sent From The Golden Hall. That album, along with 1999′s The Avenger, were the first two Amon Amarth records that received the Metal Blade “Originals”-treatment, followed by The Crusher, Versus The World, Fate Of Norns, With Oden On Our Side, Surtur Rising and Twilight of the Thunder God! Now it’s time for the final two albums – Deceiver Of The Gods and Jomsviking – to receive the same treatment and to complete the series! Both Deceiver Of The Gods and Jomsviking will be released with 400g heavy cardboard spine sleeves (inside out print), 60x60cm two-sided artwork posters and 250g inserts. See below for an overview of all versions. Pre-order your copies now via Metal Blade Records (USA), EMP (EU), or at our eBay store (EU)! For fans planning to collect all of the releases, a limited, specially designed slipcase-box is available (exclusively at EMP) that fits the complete Amon Amarth back catalog! Get it while supplies last.